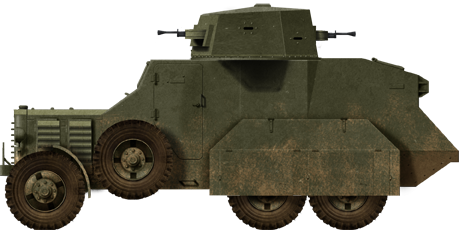 The AB 611 was designed as a colonial armored car, tailored either to serve with the Regular Army (Regio Esercito) and the Colonial Police in Africa. 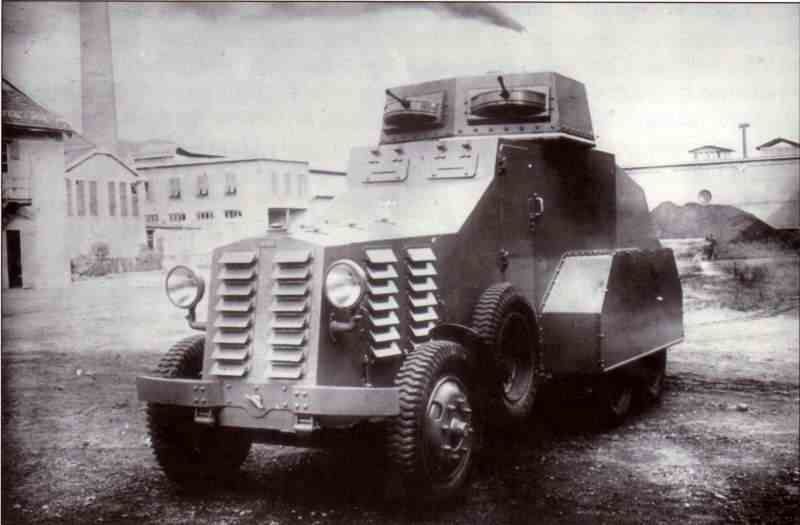 The first prototype was designed by Ansaldo in 1932 around the FIAT 611C (Colonial) truck chassis, related to the Fiat 32 Dovunque, and was adopted in 1933 by the Public Corps of Security Guards (Corpo agenti di pubblica sicurezza). 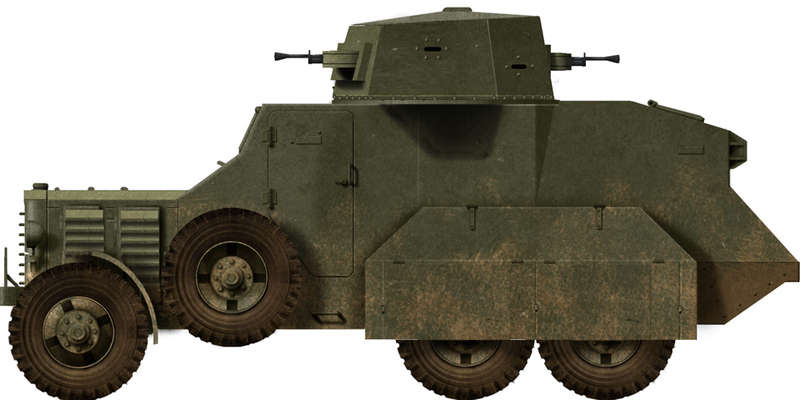 The FIAT 611C chassis was a 6-wheeled (triple axle) chassis with the rear wheels being drive wheels and the front ones being used for steering. The wheels rested on leaf spring suspensions. The spare wheels are placed between the first and the second axle and could rotate, helping to overcome of obstacles. More importantly, the model 611 had both a front and a rear driving station, allowing fast disengagement in an ambush. Both of these features were reused on the AB40/41. The engine was a FIAT 122 B, 4 cylinder, 2516 cm³ which developed 56 hp (2 000 rpm) for a power-to-weight ratio of only 8,12 hp/t. The result was a quite low top speed on flat, only 28 km/h (17.4 mph) and 9 km/h (5.5) off-road, and virtually no chance to climb slopes. Protection consisted of 15 mm (0.59 in) thick welded and riveted steel plates on a frame. The armored steel hood had armored ventilation fins on the radiator and sides. There were also two front armored doors and windows protected by folding panels for the conductor and mechanic seated in the cab. The fighting compartment behind was provided with side slits and pistol ports, and was accessed through the two cab side doors. There was also an armored door for the gunner and second driver on the left side of the vehicle. Massive armored skirts also protected the rear roadwheels. Side view of a 1932 production vehicle. Two versions of the vehicle existed, differing by the turret and armament. One version was armed with three Breda Mod. 5C 6.5 mm (0.26 in) machine guns, with two traversing mounts at the front and a single one in the hull’s rear. 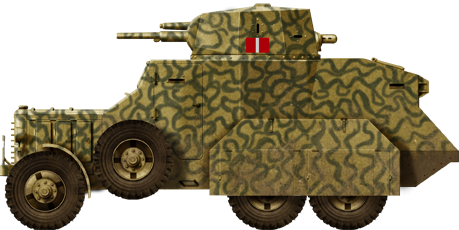 The other version was armed with a Vickers-Terni 37/40 mod.30 cannon in the turret front and two Breda Mod. 5C machine guns in the hull rear and turret to fire in retreat. In addition, there were the crew’s own rifles and 20 grenades. 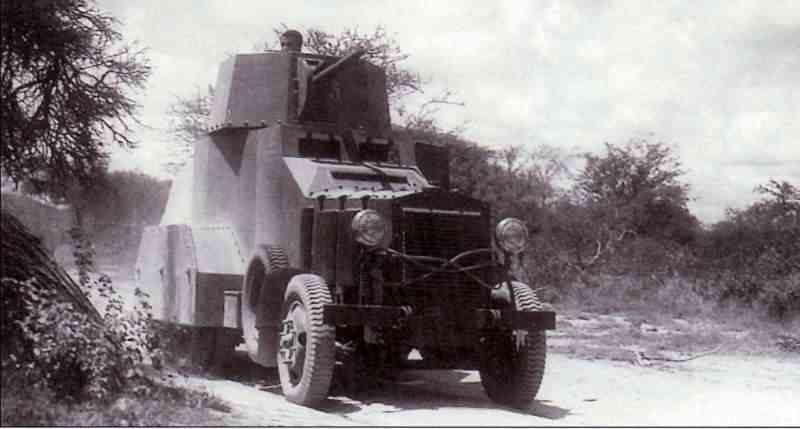 At the outbreak of the war in Abyssinia, these vehicles were mostly used on parades, but five (gun-armed) vehicles were requisitioned by the Royal Army and sent to Somalia, being gathered into an independent section of special armored cars. 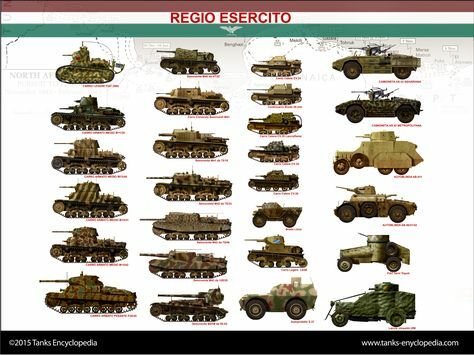 There, they had to operate together with older Lancia IZs and CV-33 light tanks. First trial by fire highlighted their deficiencies, mostly due to their heavy weight, low speed and off-road handling. In addition, the placement of the rear machine-guns for the gun-armed version was a liability in attack. On 29 March 1936, all other AB 611s were deployed afterwards in the East African colonial possessions of Italy. They also served during WW2 until the end of hostilities. Cut-off from the mainland, their maintenance was made difficult by to the lack of spare parts and overall obsolescence. 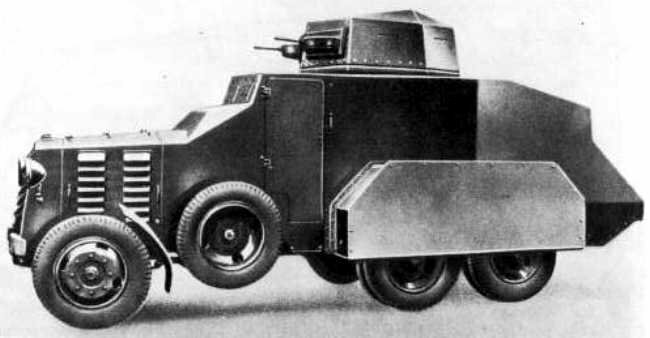 AB 611, machine-gun version, 1933. 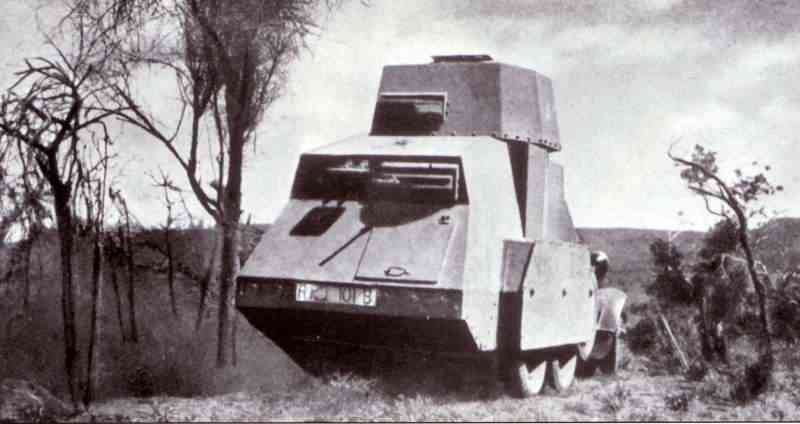 Autoblinda AB 611, 1st corps, Tambien, Ethiopia, February-March 1936.